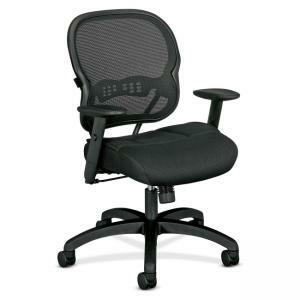 Mid-back chair features a mesh fabric seat cushion with two layers of padding for increased comfort. Functions include pneumatic seat-height adjustment, 360-degree swivel, dual-action synchro-tilt, tilt tension and tilt lock. Included urethane arms adjust in height. Frame is available in black only. Five-leg base is made of molded plastic and has hooded 2" diameter dual-wheel casters.